Contrasting colors can be an eye-catching decor element, but not when one of them comes from pet hair. But having a precious pet doesn't mean resigning yourself to a fur-covered household. 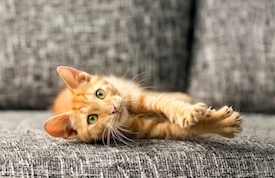 Keep your Springs luxury apartment free of unsightly pet hair with these easy tips. Simply keeping your pet clean and well-groomed can reduce a significant part of any shedding problem. Get your pet's hair trimmed on a regular basis. Just as hair stylists know the right cut for you, a top-notch groomer is experienced in the best ways to maintain your pet's cut. Brushing is a great way to keep your pet's coat healthy and tangle-free, and it's a nice bonding activity as well. FURminator makes a variety of brushes that correspond to a pet's size and length of fur. Pets react like kids when it comes to bathing, but a thorough wash and rinse is one of the more effective ways to combat shedding. Our Springs communities feature convenient pet spas that make bath time easier on both of you. Your pet's health can affect the rate and amount of shedding. Check with your vet about dietary solutions for skin and coat health. With our hardwood-style floors, sweeping is generally sufficient for removing pet hair. For best results, use a specific broom such as one from Pet Buddies that harnesses the power of static electricity to capture hair. It also has a removable head that is dishwasher-safe. Static also works well to remove pet hair from furniture. Wipe a microfiber cloth or dryer sheet across the surface. If you have kids, enlist their help by letting them use inflated balloons to catch the pieces of hair. Use a lint roller for spot treatment on upholstered sofas and chairs, bedding and car interiors. If you don't have one handy, wipe the area with a slightly damp sponge or rubber glove. A handheld vacuum is useful for picking up hair in corners, crevices and other tight spots. Are you finding hair embedded in your clothing? Add some white vinegar to the wash, and don't forget the static remover. Got a great pet hair removal hack to share? Let us know in the comments!